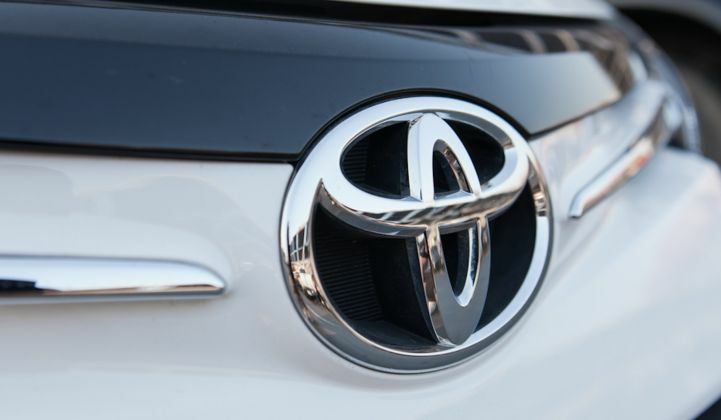 Toyota is the latest carmaker to use advanced technologies for storage cost reductions. Carmaker Toyota is pursuing advanced technology in pursuit of electric-vehicle battery cost cuts. The Japanese manufacturer recently announced it would be using artificial intelligence (AI) to help in the design and production of electric cars and fuel cells. The move follow’s Tesla’s acquisition of Grohmann Engineering last year, which gave Elon Musk’s firm access to automation technology that could cut manufacturing costs. Toyota’s AI-based approach, being led by the Toyota Research Institute (TRI) with offices in Palo Alto, Calif., Ann Arbor, Mich., and Cambridge, Mass., is more focused on primary research. “With materials problems in general, you have many variables you can control -- not only in the fundamental compounds that you select but also how you structure and manufacture the material,” said Eric Krotkov, chief science officer at TRI. The TRI work, which involves a $35 million investment over the next four years, will focus on rechargeable batteries, fuel cell catalysts and functional polymers. “These are challenging and high-risk, high-reward applications,” Krotkov said. TRI has launched a series of partnerships to develop the research. The partners were selected from an open request-for-proposals process and scientific review, said Krotkov. Initial partners include Stanford University, the Massachusetts Institute of Technology, the University of Michigan, the State University of New York at Buffalo, the University of Connecticut and the U.K.-based materials science company Ilika. TRI is also in ongoing discussions with additional research partners, according to a press note. “We aim to have a collaborative program with different teams bringing different strengths,” Krotkov noted. At least one of the existing partners already has experience in using AI for battery research. Stanford University researchers last year employed machine intelligence to identify almost two dozen solid electrolytes that could replace flammable components in lithium-ion batteries. The list was whittled down from more than 12,000 potential candidates using a process called holistic computational structure screening. “The screening reduces the list of candidate materials from 12,831 down to 21 structures that show promise as electrolytes, few of which have been examined experimentally,” said the research team in the journal Energy & Environmental Science. Even with this technological firepower at hand, it could be some time before the AI-aided efforts of Stanford or TRI scientists bear fruit. Specifically, Toyota is aiming for a 90 percent reduction in global average carbon dioxide emissions from new vehicles by 2050. One of the more notable aspects of the TRI research program is that it covers fuel cells, despite some other carmakers shying away from fuel-cell development in favor of battery-based electric vehicles. Last month, for example, it emerged that Daimler was scaling down its plans for fuel-cell cars in the face of rapidly declining battery costs. Meanwhile, Tesla boss Elon Musk, whose company recently overtook Ford in terms of market capitalization, is known for dismissing hydrogen as a vehicle fuel. Toyota, which has used AI in other areas of automotive development, has already invested heavily in fuel-cell technology to develop its Mirai model, so it is unsurprising the company does not want to abandon hydrogen just yet.